I have a good friend whose birthday happens to fall on Valentine's Day. (How lucky can you get?) So I decided to incorporate hearts into her birthday card. I have yet to master quilling but I came across a card on line with quilled hearts and thought that would be a perfect idea for my card. My color scheme consisted of white, pink and black. I started out with white card stock for my base card. I added a layer of black and then a layer of soft pink. For my focal point I die cut a white panel using Spellbinders Radiant Rectangles and matted it with black. I stamped a tree branch from PTI's Out On a Limb Revised stamp set. The birthday greeting is from PTI's Birthday Bash Sentiments stamp set. I then adhered this panel to my card using dimensionals. I made the quilled hearts in different sizes (took me a while) and drew lines of different lengths from the tree branch using Memento markers. Then the hearts were adhered to the ends of the lines. I don't do much quilling at all although I love the effects. With more practice (and patience) I hope to master this art. Hope you're having a wonderful day flowing with creative ideas. Thanks for stopping by! Oh my word Olga, this card is spectacular. I love it! I love your quilled hearts, Olga. What a beautiful card. Thanks for linking up with us this week at the Sister Act Challenge Blog. Your colors are so pretty. And the quilled hearts add beautiful dimension and texture. They hang gracefully from the limb. Thanks for dropping your card off at 613 Avenue Create. Beautiful card! Love the quilling and enjoyed your story on how you got started in crafting! 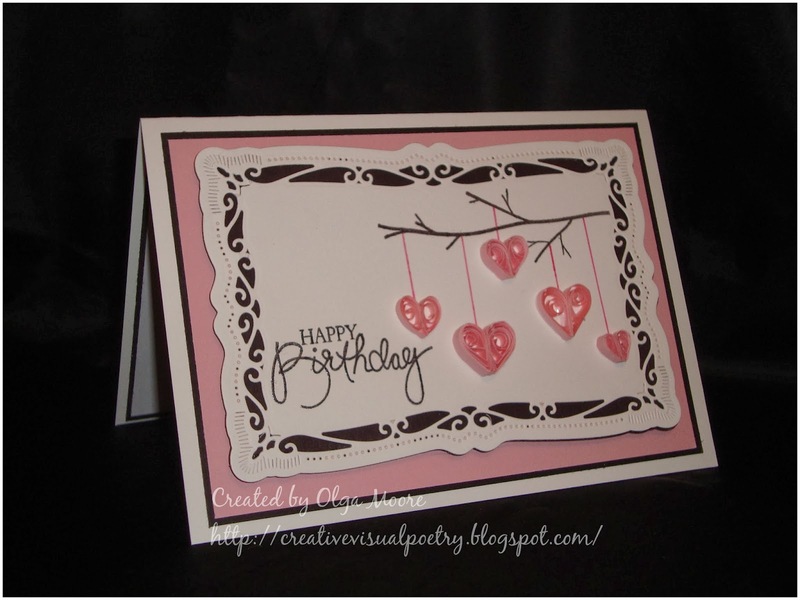 So glad you shared your lovely card at TTCRD. What a beautiful card, Olga! I love seeing your sweet cards shared in our challenges, and I thank you so much for playing along with us. May God bless your week, and please stop by to join us again real soon. God bless you! Give-away on my blog for Top Dog Dies Blog Hop - awesome prize! Your card is beautiful and I am following by email now too. Hi Olga, I'm here from the Outlawz! I dabble in quilling too, I think it's very pretty! Olga, this is gorgeous! Such a lovely card - someone will be blessed to find this in their mailbox! Happy Sunday!